Oooooooooooo, I love this spread! Those dining room chairs are the best!!! This is the definition of glam! Just blogged about that gorgeous dining room this morning! I mean seriously I was SWOONING over the entire issue! My FAVE one in awhile...every spread was better than the next and Jackie's literally stopped me in my tracks! LOVE that she is such a avid shopper of Ebay...such a stylized layered look with super chic Regency picks...I mean that table base is BEYOND! So so good! I love this! 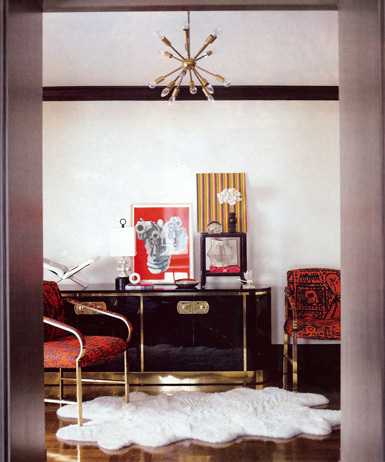 I adore white area rugs (especially hides) and the GLAM of the gold! Gorgeous! I'm in Australia so we haven't gotten the March edition yet, but I will be first in line for sure! Great blog, thanks for the inspiration! Let me know what you think. I'm always interested in what people with such fab pages have to say about mine! Thanks! 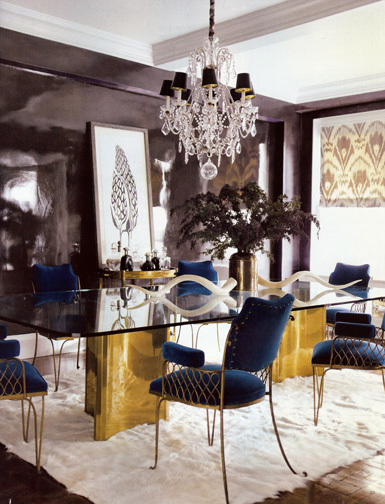 These pictures are gorgeous- the dining room and bedroom look so plush and luxurious! Yes, how great was this layout!! Hollywood regency done right!! !